Root Rescue's Transplanter MS-CS Gives Landscape Plants a Proven Advantage in Drought. University testing results Published in 2015. 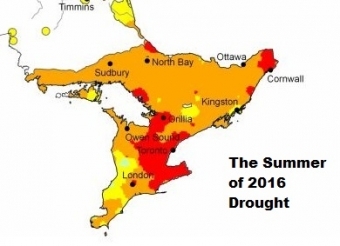 What the University of Guelph found could save the trees and shrubs that you plant this summer from failing in one of the worst droughts that we've seen in years. Thousands of trees (on 6 sites in Southern Ontario) were tested by the U of G over the course of 4 years. The team, led by Professor Mike Dixon, was looking to see if trees inoculated with the Mycorrhizae in Root Rescue's Transplanter would exhibit increased drought tolerance in the critical first summer season after a spring planting. The Test Trees were inoculated with the Transplanter MS-CS Solution at planting time (late May / early June) - the Control Group was given an equal amount of plain water. Here's a narrated tour of exactly how the U of G' experimental design, and how they carried out their research. The extensive trial results were published in the peer-reviewed journal 'Acta Horticulturae' in 2015. There are 9 Endomycorrhiza and 9 Ectomycorrhiza in Root Rescue's Transplanter formulation, one or more of these beneficial fungi will form a symbiotic partnership with 95% of landscape plants. Within days of the inoculation, the host plant will be given improved access to soil water - an advantage that will last for the life of the plant. If you're planting landscapes for a living this summer, can you afford NOT to look at what the U of G researchers found? It's time to Root Rescue!